bathroom cleaners and where to buy them. Download a FREE list of safe, store-bought bathroom cleaners and info on where to buy them now! I know, I know change is hard…but switching to safer cleaning products is not! This sounds like ALOT of work! 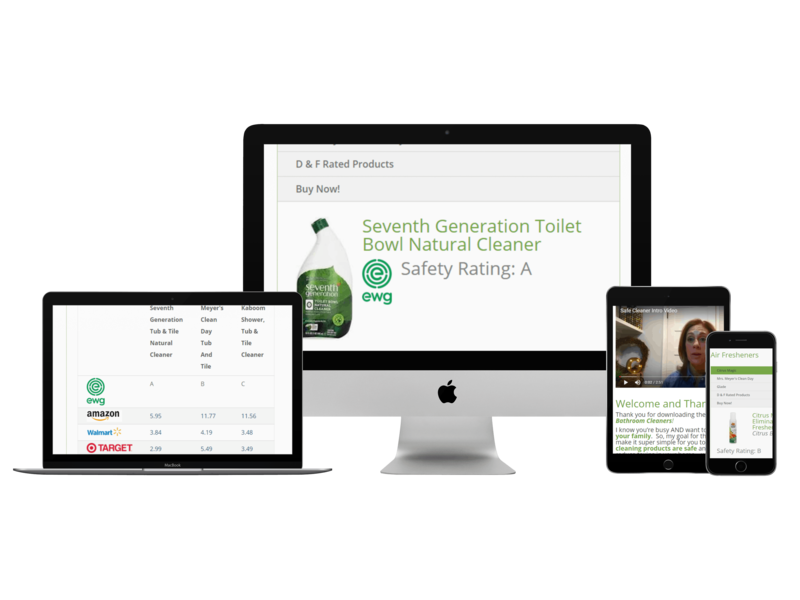 I’ve done all the research on which cleaners are actually safe using the Environmental Working Group Healthy Cleaner Database as a guide. All you have to do is check the list and grab the product off the shelf or click to order online! Environmentally friendly cleaners are SO expensive. Not necessarily, in fact prices have come down as more choices have come on to the market. And, since the products are available at mainstream stores they often go on sale. “Green” cleaners don’t work as well. I have personally tried every cleaner on this list. My family of 5, plus pets, has put them to the test and I’ve been happy with each of them. They get the job done and are safe for my family and the planet! I don’t shop at expensive, organic markets. No worries! The products on the list are on the list in part because they are available at mainstream retailers so you don’t have to make a special trip to a store you don’t normally frequent.